When I think of Sunday Supper I think of food that takes a little more time to prepare than the usual weekday fast and furious. For us, Sunday Supper is a time when no one misses the meal and we take a few extra moments for savoring, conversing, and connecting. Whether you’re vegan, vegetarian or full-on omnivore with a roast in the oven, what says “warm, friendly, comforting meal” more than Oven Roasted Potatoes? Tip: The smaller and more compact the potato is, the better I like it. It’s sweeter and more flavorful than any huge, starchy spud. Preheat your oven to 375. Clean and quarter the potatoes. (I don’t peel if they’re organic.) In a bowl, whisk 4 tablespoons olive oil, 1 tablespoon red wine vinegar, 4 cloves of crushed garlic and oregano, paprika, sea salt and pepper to taste. You can add any other herbs and spices you want. Sometimes I add chili powder. Coat the potato pieces in the oil. Spread the coated potatoes in a single layer on a baking dish and put them in the oven. The cooking time will depend on the size of your pieces, but let’s estimate 25-40 minutes. Halfway through, turn the potatoes so all sides get browned and re-season with a bit of salt, pepper and oregano. They smell so good while roasting and the finished dish is absolutely gorgeous! Have you oven roasted potatoes? Tell us how you like them done. 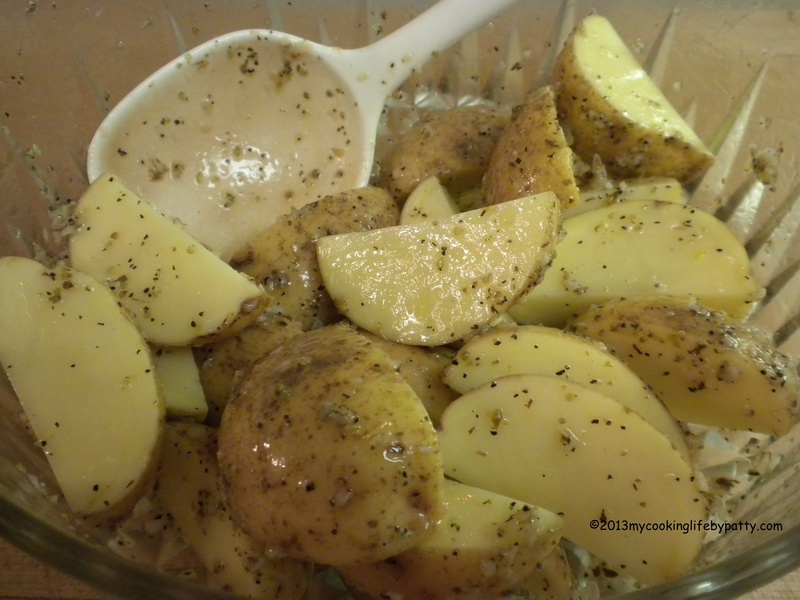 This entry was posted in Cooking, Recipes and tagged choosing potatoes, Garlic, oilive oil, oregano, oven roasted potato, red new potatoes, Roasting, Sunday supper, yukon gold by mycookinglifebypatty. Bookmark the permalink. I love the mix of ingredients! 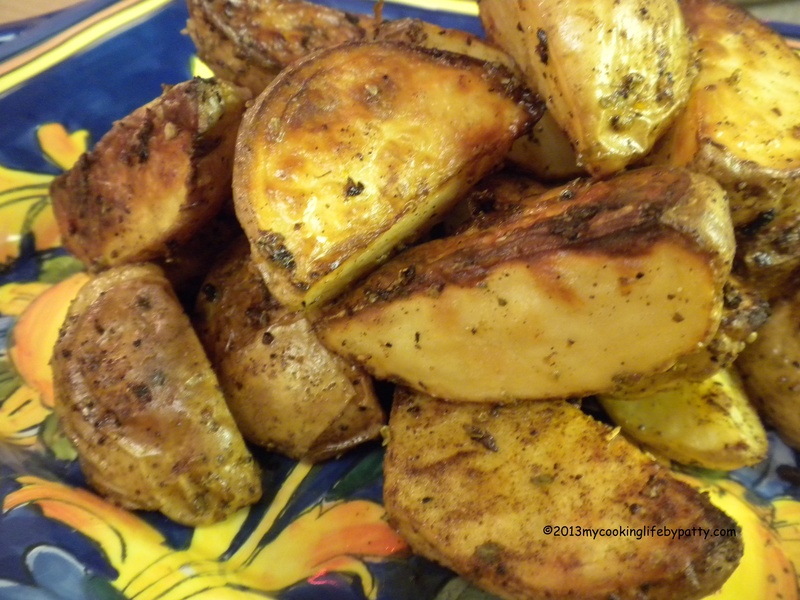 What a great mix of flavor jazzing up roasted potatoes! Thanks! I love reading your blogs. I have nominated you for The Versatile Blogger Award. http://mauldinfamily1.wordpress.com/2013/01/16/the-versatile-blogger-award/ This was my first award and I hope you will accept and display it with honor. Thank you so much Debra! I do accept and I have, in my computer-illiterate fog, managed to display it. I read your post and enjoyed touring the other blogs you also nominated. Thanks for dropping by, Kathy! I’m big on the garlic in them and put at least 4 cloves. They mellow out during the roasting. I can smell them already, yum. I usually fry them in a skillet or boil them, what we call ‘Stewed Taters’. I haven’t roasted potatoes in years. Your recipe brings back good smells and good tastes. I will have to try this recipe soon. They do smell incredible while roasting!